Forgive the delay in updating – I’ve made sure you haven’t missed anything! We had neighbours for the first few days a family had been staying supporting a lass who was part of the GB team at an event at Pompador’s equestrian facilities. Sadly her horse had a problem so she only got to take part in the first of three events. Roy and Rose live next but one and he is working on finishing off the gite between theirs and ours. He’s one of those skilled clever people who can do that sort of thing – he also plays for one of the local village sides B teams but would be the first to admit to no-longer being in his prime. Rose spends a bit of time each day tending to her four horses, one or sometimes two of which she rides in the field out the back. All this activity is observed by their three dogs. S and I had a trip to Limoges for the Summer sales, we pottered about and S got three things for less than the most expensive items pre-reduction price. Rather to her satisfaction. We had a light lunch with me having a ducky salad cos of the heat, it was 35 degrees… It was hot last month, all month, mainly in the low thirties which we have got nicely used to but there have also been a few days where the temperature hit 40 plus. This neck of the woods was the hottest bit of France a few times being a deep red on the weather maps. Accordingly we took it easy and S had a few cold baths due to the canicule (French for heatwave) while I perfected making sure upstairs was cool keeping blinds and windows shut when the sun was on them and open when it wasn’t. There is a period of the day when the sun seems to come in both the front and back roof windows which I fear breaks the laws of geography but I am not complaining. 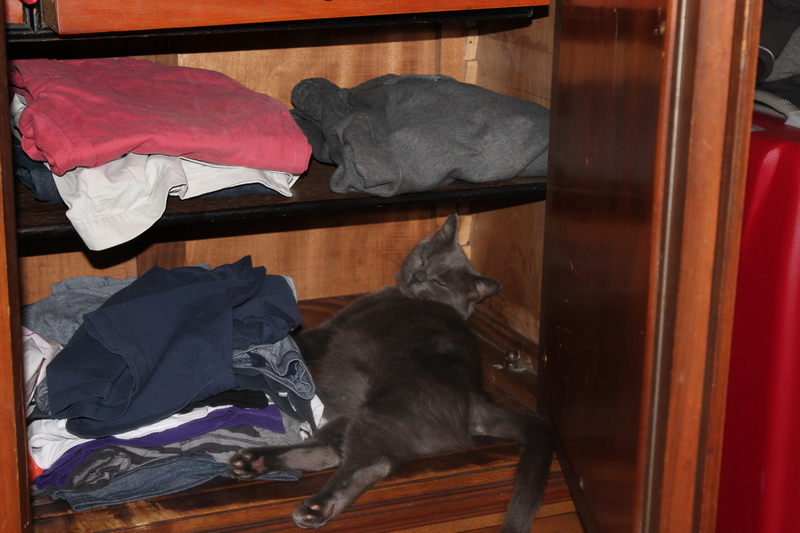 The cat found the coolest place she could and would disappear there for hours on end. Wandering around the field one lovely afternoon I was confused by a popping noise eventually realising it was the seed pods of a Broom bush bursting in the heat! Yours for less than a quid! 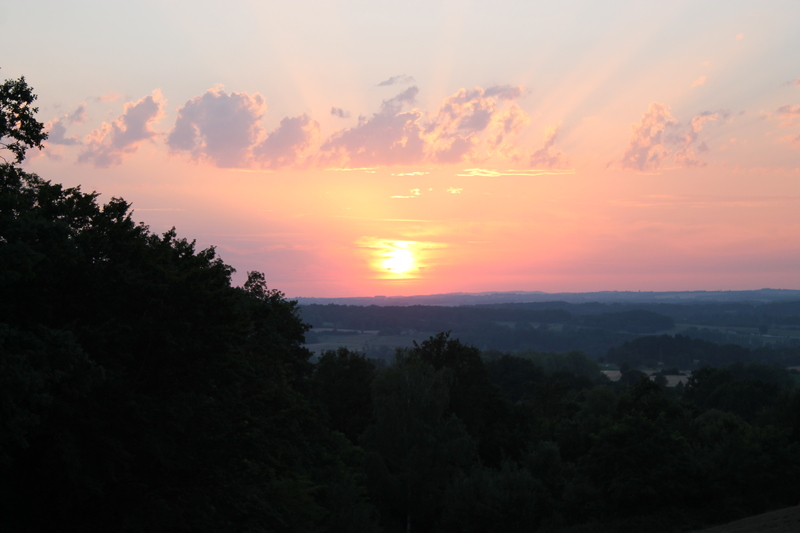 Not having moved far we know the small towns – Lubersac & Pompadour – well so don’t need to do much exploring. I have done a little bit, not much, of helping out Roy with his various works in my non-skilled way and we explored some local walks in the cooler evenings. There are goats along the way which are talkative to say the least and we’ve debated trying to update our ringtones with the outbursts of a Limousin goat! That however may not fit in so well when we get back on a early morning train or at the fitba. The coverage of the Tour de France on French TV was extensive and helped prevent us getting sun stroke. Watching live was a good build up for our trip to see it for real. There were a few crashes that took out the man in yellow on consecutive days – the first being quite a pile up and how none of the riders hit a concrete lamp post that a couple of dozen of them careered towards at break neck speed is something I still fail to understand. They halted the race give the walking/cycling wounded a chance to finish the stage and get patched up overnight if they were up to it. One Sunday we went to racing at Pompador. We had a drink across from the chateau then paid our 6e each (which is less than a fiver at the moment) and went in. The Chateau is actually available for sale, Roy tells us for 1e! The purchase would depend on the buyer having an additional lump of cash of 4,000,000e minimum that is required to carry out the work needed on the rather impressive building. The rumour is that Angelina Jolie and Brad Pitt viewed it a few months back as their current chateau is a bit small for them! That’s no doubt one of the perils of international megastardom… How quickly one outgrows ones castles! Anyway no bid has been made by them or anyone else as far as we know. The racing was good. 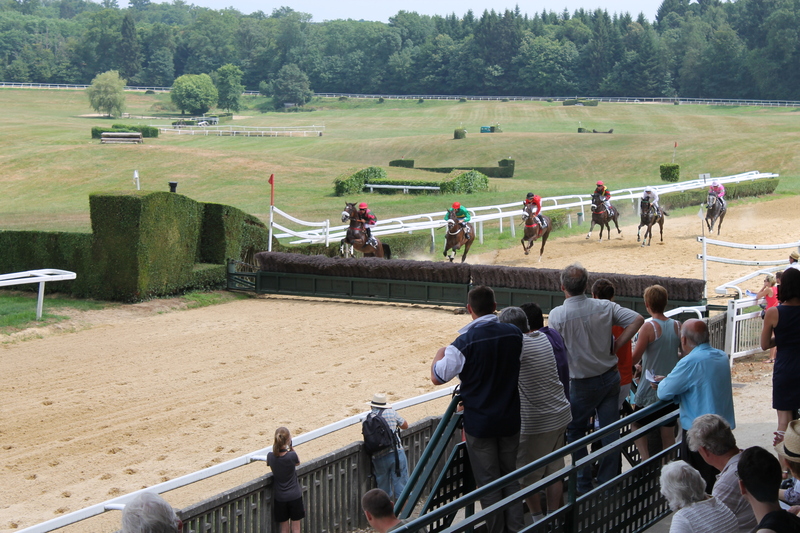 They mix up the styles and sort of races – flat, steeple chase and cross country which is cool. 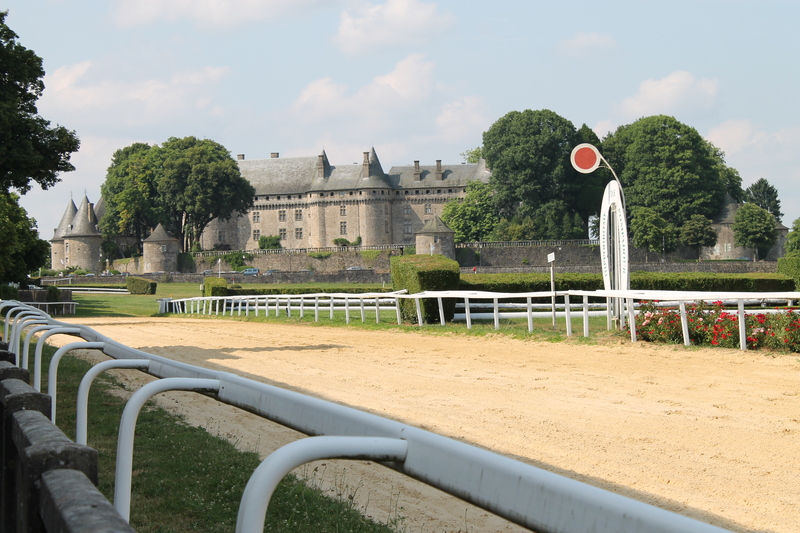 A couple of jockeys were unseated but all horses and riders were fine. 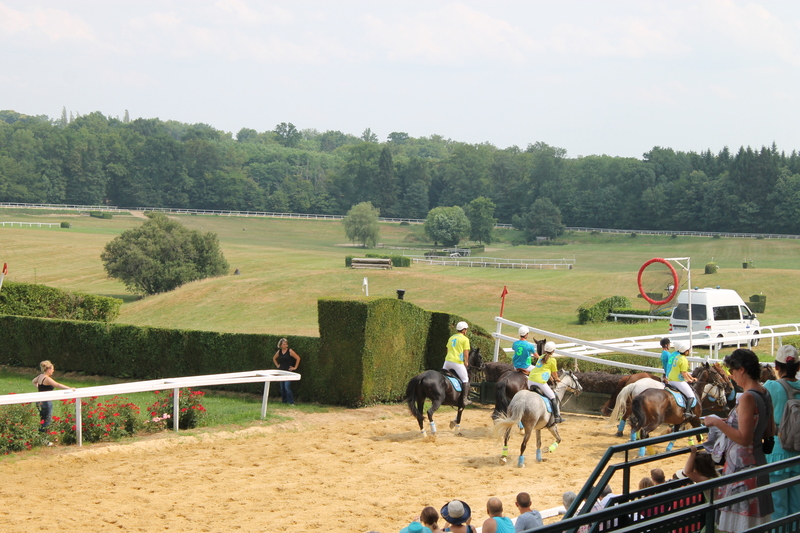 Horseball was demonstrated between two of the races – it’s a sort of basketball/cavalry charge type thing – which involves no little skill on the part of both riders and horses. Lots of people were in attendance who mainly stayed in the shade but it didn’t seem to have the toffs and non-toff atmosphere you get a racing in the UK. 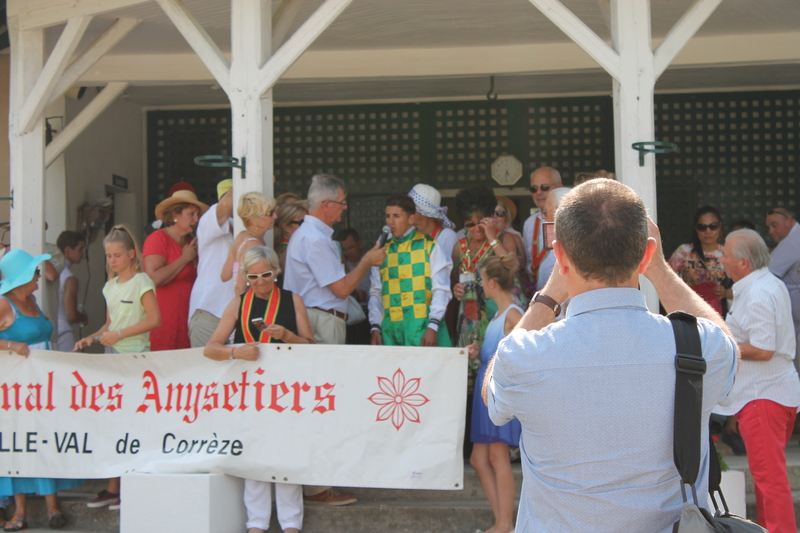 We watched the first three races and invested in the 4th winning 5.80e from a 4e stake. 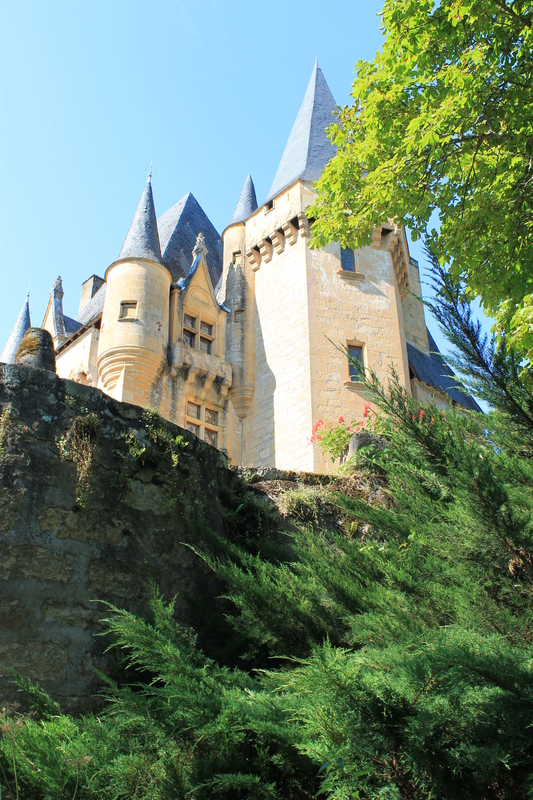 More than enough to buy the chateau but sadly not sufficient for its upkeep! As regards trips we went to St Eyzies-de-Tayac another riverside village. En route we saw the aftermath of a crash with a car in a ditch on the wrong side of the road – clearly everyone was fine. That day we had a couple of close calls with dafties coming the other way whizzing along the middle of the road on blind bends… Always a joy. We arrived in time for lunch and for some reason I had chicken and chips while S had an omelette. We then enjoyed the air conditioned National Pre-Histoire Museum not just because it was cool. It was also rather interesting and well laid out. St Eyzies is a pretty village so had a wee wander around. 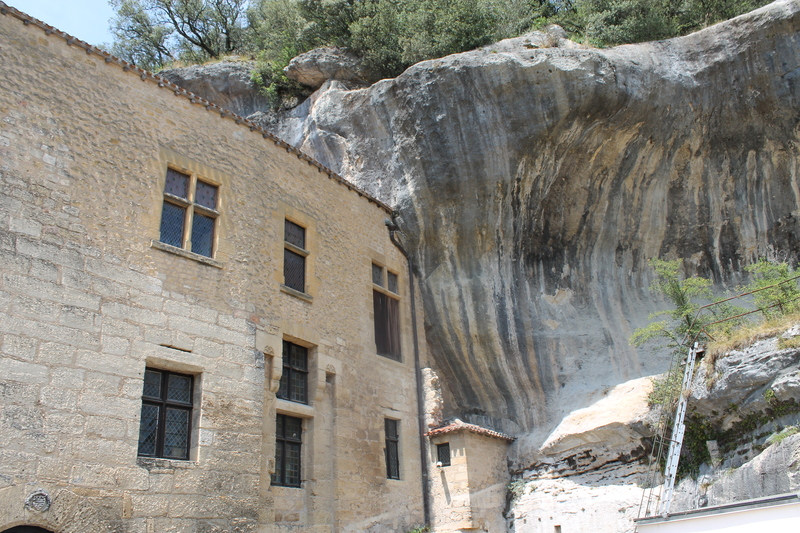 Then we headed off to our next stop, eventually finding Fort Maison de Reignac – a large house build into the cliffs. It’s very interesting wandering around a normal room to turn and realise that one wall is a rock face. The place was much more accessible than in the UK without the dreaded and limiting velvet ropes everywhere. It apparently could be defended by only fifteen men if attacked. It also had an exhibition of torture paraphernalia which showed no lack of imagination or human ingenuity. Apparently the guillotine was in fact a Scottish invention… Hurray for the jocks! L There were many rather disturbing implements – did who know that a skilled practitioner could cut someone in half – starting at the groin and keep them alive, if upside down, for some time before they unsurprisingly succumbed? Noteworthy also was a large metal bull which was hollow into which you put the victim then light a large fire underneath it cooking the poor no-doubt screaming so-and-so inside. I’ll never think of those plastic cows that are still dotted about Edinburgh in the same way again. 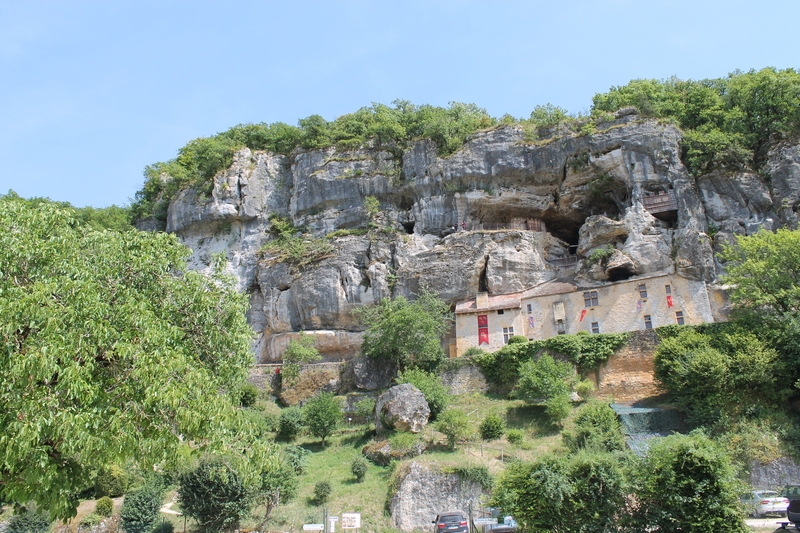 On the way back we paused in St Leon sur Bezere – a Plus Beau village – for a drink. It’ a nice wee place but which we didn’t think was that special, a Beau but perhaps not a Plus Beau! Someone did well to get them that accolade… Going back went thru St Robert – another PBV – as w neared home it was rather more impressive. We had a trip to SYlP and wandered around the Rue des Arts. What’s that I hear you both ask? A few shops have been opened up flogging three or more different local producers work – clothing, jewellery, painting, pottery, you name it it’s in one of the seven places. That’s well over twenty producers of things and stuff who all have an outlet and the opportunity to further establish themselves/make some money/be discovered… It’s to ensnare the visitors as July and August is holiday time en France and the roads are a little busier with Dutch cars and the streets occupied by many of the dreaded tourists! (Don’t worry I see the irony of that comment). On that trip we bumped into Mike – from the last hoose – who’d no doubt thought he’d got rid of us! We were invited to join Roy in Pompador – where they have a wee hoose – to play petanque with some other local Brits. Not that either of us were much good it has to be said. S & I lost then I was part of a 2:1 girls v boys win. 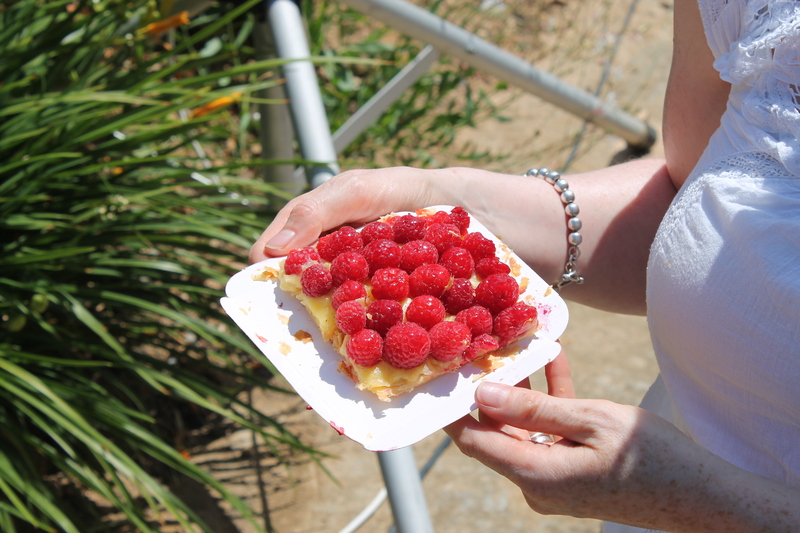 The next weekend we sought out a massive tart. No really, we’ve been here a while and seeing the fliers thought why not… A massive fruity tart at that. Insert Sid James laugh here if you wish otherwise behave! 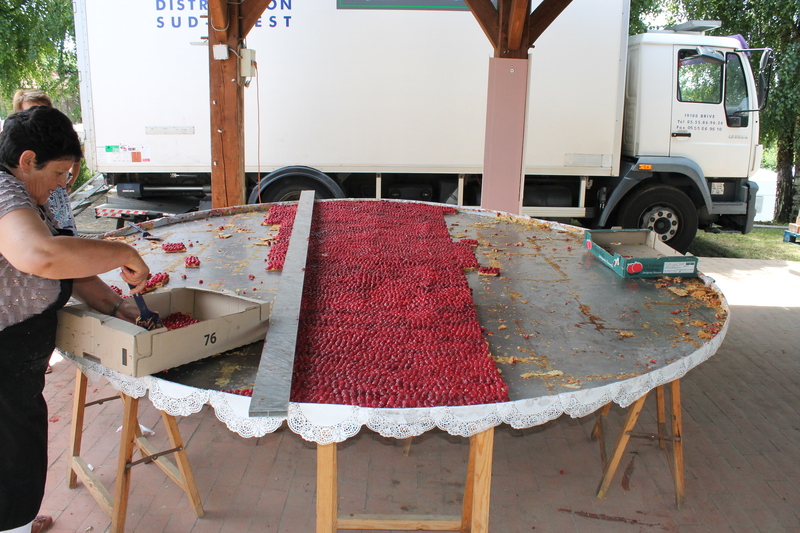 In Conzeze which a village about 7 or 8k’s along the road they hold an annual Fete de Framboise where in 1997 they made the world’s largest raspberry tart. It was authenticated and verified by the Guinness Book of Records people who no doubt had a sample. Anyway it was another hot day and we got there before this year’s version – rather a tame effort as you can see from the pictures – had been consumed in its entirety. Very nice it was too, sadly S found the portions a little large and I selflessly had to finish hers off for her. There were also various stalls and mini-exhibitions, one being a blacksmith who was banging out his wares* using a rather swanky mobile forge to do a demonstration which was interesting. * If anyone tittered at that you should be ashamed of yourself. We went to SYlP for the Bastille Day bash which was excellent. Again we ended up chatting to complete strangers in French as we had stuff from the barbeque – they were down from Limoges having lived in SYlP until recently. It was a wide ranging blether and they brought up the comedic behaviour of the Greeks government which they found almost as amusing as the fact Andy Murray got married in a “jupe” which is a skirt. I assured them that a kilt and a “jupe” are very different things. 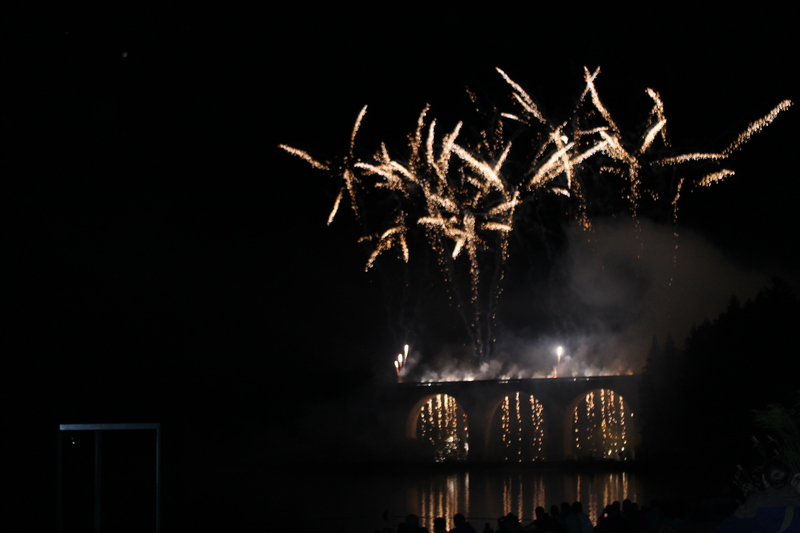 The Bastille Day do was like the St Jean de Feu one of the previous update but with about four times the number attending and a larger bar. We wandered about and had a blether with one guys from the football and exchanged a few pleasantries with a couple of other people we know slightly. As darkness fell and the accordion based band filled the marque’s dance floor the atmosphere remained relaxed and jovial. It was very busy with people all around the lac and all was good despite many a small child having consumed Bard de Papa’s (candyfloss) the size of their torsos! We found a spot for the feu de artifice (fireworks) and as darkness fell the European anthem was played – as it is here quite regularly at large events. Nigel Farage wouldn’t approve so it must be a good thing. 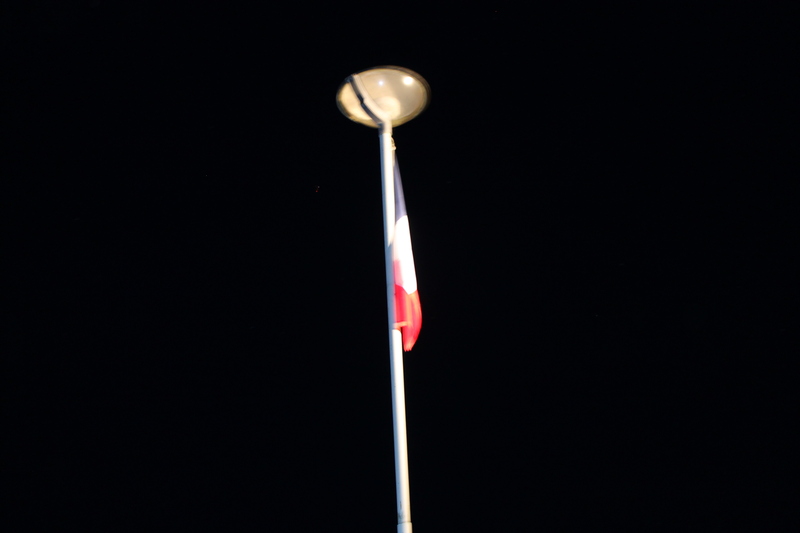 Then they raised the tricolour as the Marseillaise was played. This was followed by the most impressive fireworks display either of us have ever seen. The only pic shows the setting with the railway viaduct behind. As well as being a great backdrop it was also used as part of the display despite the line still being in use. They were loud and fitted in with the musical accompaniment several times filling the sky with colour and light – making me think of the rather screwed up display in Oban when all the fireworks went off at once. The next day we met with Jose and Joelle who had returned from a long trip to Portugal. He said the fireworks had lasted 23 minutes the night before, they had watched them from across the lac. 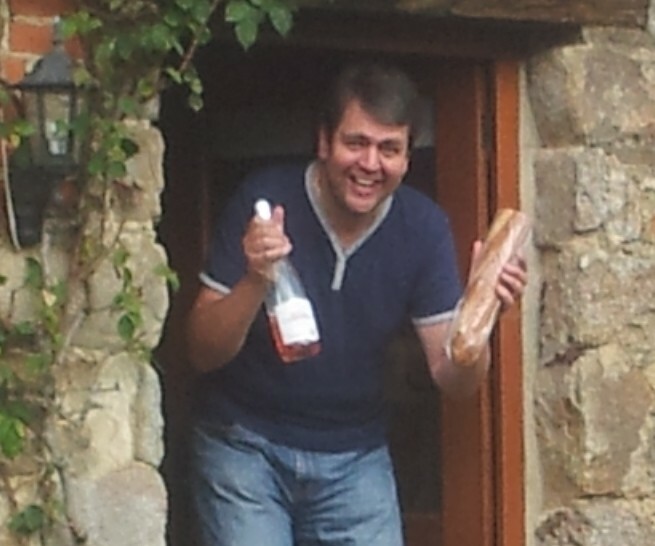 We blethered in as close to French as we can manage for four hours, no really four, in Segur le Chateau. It was good to see them again. Next will be details of our trip to see the Tour de France and some of the nearly 400 pictures we took!